• 96% of MiFi and 4% of USB Modem devices were sold in 3Q CY2018. • LTE based MiFi devices captured 96% market share in terms of unit shipments. • Up to 75% of data cards were sold under 25-50 USD price band. • 96% of data cards were seen operating on Qualcomm Chipset. 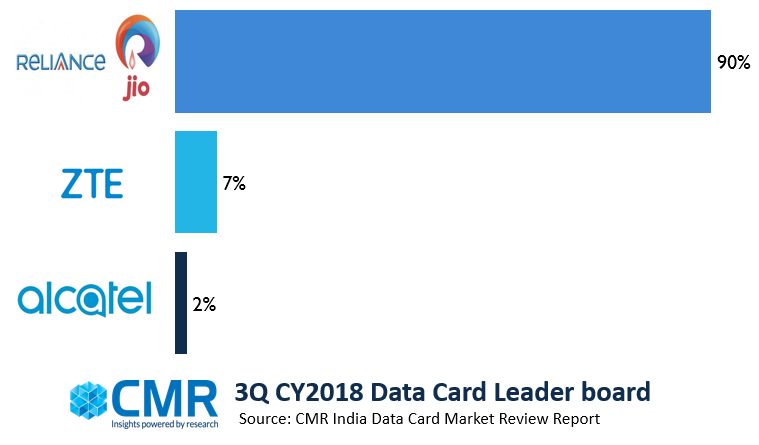 Gurugram/New Delhi, December 22, 2018: The Indian Data cards (USB & MiFi) market stood at 0.5 Mn and witnessed 52% decline in 3Q CY2018 when compared to 2Q CY2018, as per CMR’s India Data Cards Monthly Market Review released recently. “July witnessed growth in the sales due to stock clearance from the previous quarter. August was the lowest data cards selling month. Alternatively, September observed sales growth due to the forthcoming major festivals in October and November,” observed Shipra Sinha, Lead Analyst, CyberMedia Research. Almost 99% of the data cards with 150mbps internet speed were sold during 3Q CY2018. Reliance Retail’s JioFi 3 sustained its popularity and contributed 69% market share in terms of unit shipments. Reliance Retail’s JMR1040 MiFi was the second most popular model with 21% market share in terms of unit shipments. In terms of technology, 4G/LTE data cards were the only contributor. However, this category witnessed 52% decline when compared to the 2Q CY2018 in terms of unit shipments. Reliance Retail was the only major contributor to the market in 3Q CY2018 in terms of unit shipments but witnessed 52% decline when compared to the previous quarter. Huawei moved out of the market in 3Q CY2018 on account of termination of its data card manufacturing. “3Q CY2018 didn’t prove much fruitful for the data card sales despite lucrative offers during festive season hence, 2H CY2018 is expected to close at around 1.1 Mn. Major Brands must focus on enhancing the look and performance of their products at an attractive price along with better marketing strategy to improve the data card sales” Shipra concluded.